It’s lawyers who get the blame for pages like these. No, really, our lawyer friends helped us write this one. May Allah make us (all) from the muttaqeen. 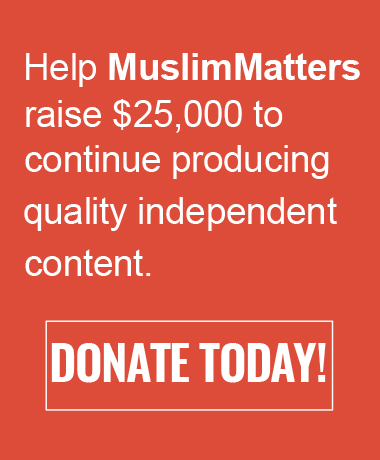 While MuslimMatters (MM) exercises editorial oversight over content on the web site muslimmatters.org, every article and every comment that purports or seems to have any connection to MM, whether it be on a web page, social-media feed, etc., anywhere online or in print, etc. necessarily represents only the views of its author(s). These disclaimers apply to any speech, writing, or image, created or posted by any person (hereinafter referred to as “Author” or “Authors”) including but not limited to MM staff, guest writers, and regular or casual visitors to the site. Authors choose what subjects they wish to discuss, and produce or compile their own content (including the text of articles, quotations, graphics, videos, etc.). Each Author is responsible for insuring that his or her content is either original material or is used legally. Each Author is responsible for insuring that his or her content is appropriate for publication on the internet, in tone, language, message, etc. Any opinion expressed in any article, comment, etc., may only be attributed to its Author(s), and as such may not reflect the opinions of MM, nor of MM’s board, editors, writers, and readers. Likewise, MM is not responsible for the accuracy of any information posted by any Author. In particular, every person who posts, quotes, cites, copies or otherwise relies on any article, comment, etc., associated in any way with muslimmatters.org bears sole responsibility for his or her actions, choices, and words. When MM publishes an article under the user name “MuslimMatters,” that content is solely the responsibility of Muslimmatters Inc., a Texas NonProfit Corporation. MM reserves the right at any time, for any reason or for no reason, to edit or remove any of the content posted anywhere in the domain muslimmatters.org. MM also reserves the right at any time to take any action with respect to any content or information within its control to comply with the requirements of any law or legal authority. MM’s religious advisers are tasked with overseeing the broader issues and providing advice when requested by the authors. Although an article appearing on MM is generally accepted by the religious advisers, each author is given lots of editorial freedom of expression and may choose not to agree with the religious advisers’ advice. The religious advisers reserve the right to comment if and when they please, but their silence cannot and should not be assumed to hold ANY meaning (they are probably just being nice and giving the authors private rather than public criticism). All articles on MuslimMatters.org are copyrighted, with all rights reserved to the extent permitted by law. Please also note that the name “MuslimMatters.org” or “MuslimMatters”, the MM logo, and the phrase “Because Muslims Matter” are trademarks belonging to MuslimMatters.org. For internet or any electronic usage: please only use excerpts (no more than half the article), with specific link to the article on MM, and a clear citation at the beginning of the excerpt. Under no circumstances, may full articles be reproduced electronically without the express permission of MM. For non-electronic usage (newsletters, flyers, etc. ): full articles can be reproduced with full citation and weblink to the exact article. The credit to author and MuslimMatters.org should be at the top of the article, and a weblink to the specific article location should be provided at the bottom. You may shorten specific link using tinyurl.com. Any original photographs on MM cannot be reproduced or cross-posted without explicit permission from MM. Note: If your intended use is commercial, you must obtain from MM express permission in advance of any use, regarding scope and intended usage. Please note that this last section forces a necessary distinction between material copyrighted by other than MM of which MM makes fair use, and all other material at MM in which MM claims copyright on its own. As to the former, anyone seeking to make use of that material must seek permission from that owner or owners. And as to the latter, the preceding section “Copyright Information” applies in full. If you wish to make use of material found on MM, but have any doubts whether MM owns the copyright, contact us at info@muslimmatters.org.